The January Market Rebound: The Resumption of The 2009 Bull Market, Or Just A Correction In An Uncompleted Bear Market? In our January 2nd Keys To This Week report (access requites subscription), we suggested that our subscribers “consider putting a small, preliminary percentage of available assets to work at or near this level in the event that the US stock market does indeed stabilize from decade-long support levels.” We actually displayed and discussed one of those secular support levels, in the NYSE Composite Index (NYSE), in our previous January 23rd free update. 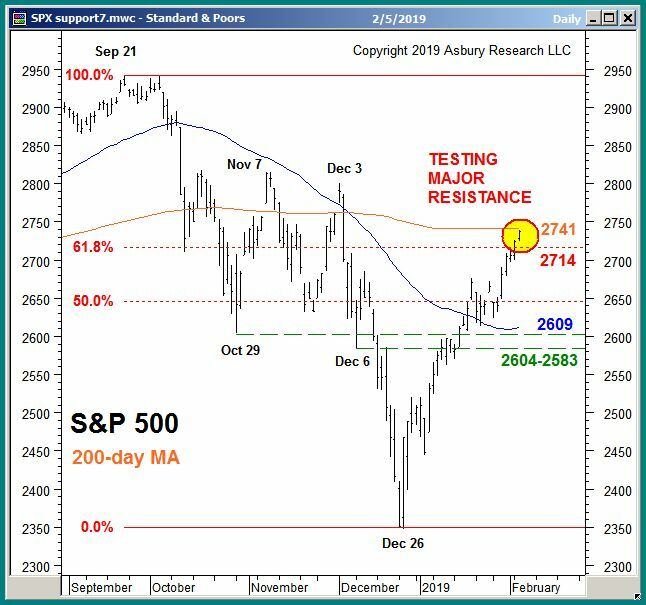 About 2 weeks later, in mid January, we suggested that subscribers consider putting an additional portion of available assets to work as the benchmark S&P 500 (SPX) rose above what we considered to be primary minor overhead resistance at 2600. The chart below shows that SPX has since risen by an additional 140 points or 5% and is currently testing major overhead resistance at 2741. It represents the index’s 200-day moving average, a widely-watched major trend proxy. If SPX can manage to sustain a rise above SPX 2741, while maintaining its recent technical strength as indicated by our Asbury 6 key market internals, it will clear the way for a retest of the September 2018 all-time high of 2741. If the market weakens from here, however, it would warn that the current major downtrend in the S&P 500 is resuming. If it’s the latter, we will move to a defensive stance that protects investor assets. The video available below shows how we have actually managed investor assets amid these recent market conditions for our Asbury Research Management clients. Thank you for your interest in Asbury Investment Management. We offer a unique approach to investment management that is dynamic and based on the current condition and risk/reward profile of the financial markets, rather than on whatever your pre-set investment allocation might be. Our portfolio team monitors the current condition of global financial markets every day, as it pertains to your account, and alters our tactical and strategic investment approach as market conditions change. We hope you will find these bi-weekly commentaries and accompanying videos informative, educational, and useful. Feel feel to contact us with questions about the markets, and for further information about our unique approach. Click Here for our 02/05/2019 Video Review, which explains how we have recently utilized Asbury Research’s market analysis and investment ideas to professionally manage client portfolios. For further information about Asbury Research Management, please email contact@asburyinvest.com or call 1-844-4-ASBURY (1-844-427-2879).